Laurel Ridge at Bonita Bay is a single family home community located in Bonita Bay of Bonita Springs, Florida. Laurel Ridge is located just off of Country Club Blvd. Laurel Ridge consists of only one street called Laurel Ridge Court. Homes in Laurel Ridge were constructed between 1989 to 2006. There are no vacant home sites remaining on which to build. The community is complete and there are are only resale homes available. 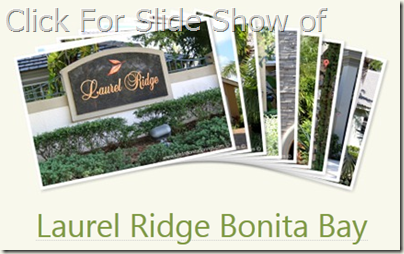 Laurel Ridge at Bonita Bay is a small community with a total of only twenty single family homes. Home sizes range from about 1,700-3,500 square feet of living space. Nearly all homes have a private swimming pool. Views from the lanais of homes in Laurel Ridge are of wooded area preserves or lake views. Home owners in Laurel Ridge not only enjoy the resort lifestyle of southwest Florida but also the great amenities of Bonita Bay. Home owners in Laurel Ridge enjoy easy access to the Bonita Bay walking path system as well as access to the nearby River Walk Park. Bonita Bay is bordered by Spring Creek, Imperial River & Estero Bay w/direct access to the Gulf. Residents enjoy Bonita Bay’s private beach pavilion, 12 miles of bicycle and walking paths, basketball, boating/canoeing/kayaking, and 3 waterfront parks. Bonita Bay Club is member owned & offers 5 golf courses, 18 Har-Tru tennis courts, a state of the art fitness center & Olympic pool and a clubhouse offering casual as well as fine dining. Bonita Bay also offers a full-service marina w/Gulf access via the Imperial River. Due to the smaller number of homes available in Laurel Ridge there are generally not many available on the resale real estate market. Other homes in Bonita Bay which are similar to Laurel Ridge are located in River Ridge at Bonita Bay and Woodlake at Bonita Bay. To learn more about the amenities of Bonita Bay, read also Bonita Bay Golf and Country Club.